Limestone is often used to accent patios, pools and bathrooms. 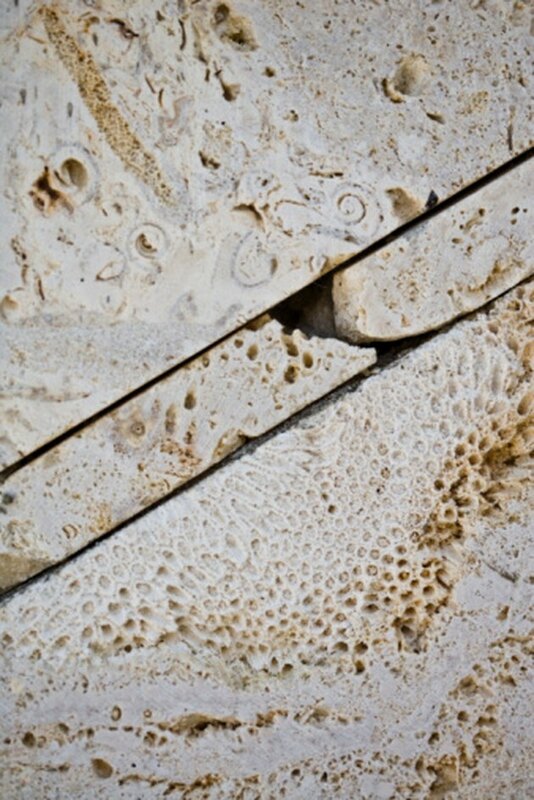 These high-moisture areas leave limestone prone to developing mildew stains over time. Use of the wrong product could damage the stone. Never use acidic products that contain vinegar, ammonia or even citric acid to clean limestone. Instead, use a mild bleach solution, which will not react with the stone or its sealant. Once you have finished cleaning, be sure to rinse the area thoroughly. Clean mildew stains from limestone with a mild bleach solution. Mix a solution of 1 tbsp. bleach and 1 gallon warm water, or 1 tsp. bleach in 1 qt. of water. Dip your scrub brush in the water, then use it to scrub the mildewed area. Leave the bleach to penetrate the limestone for five minutes. Wipe up the bleach cleaner with a clean sponge or rinse the bleach solution away with a hose.